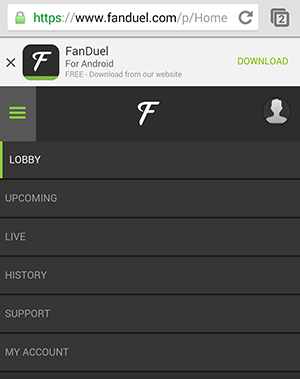 FanDuel provides a free and simple to use mobile app for the iPhone, iPad, and Android phones. The iPhone/iPad apps can be downloaded from the Apple iTunes store. The Android app is available in the Google play store. The Android app can also be downloaded from the FanDuel.com website by scanning their QR code or by installing it on your Android device. 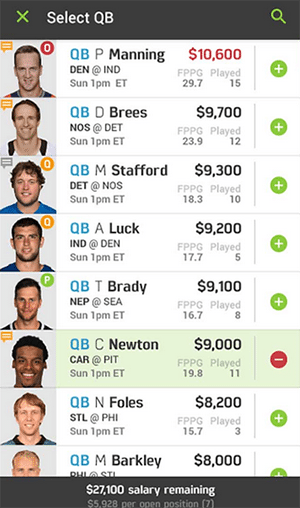 Click here to visit the FanDuel website. 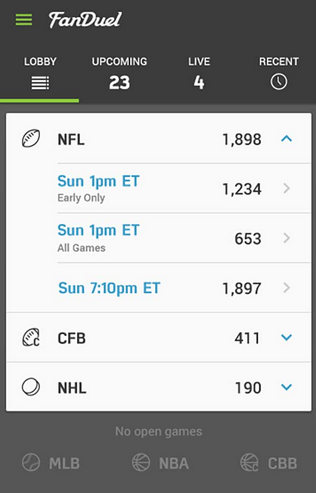 The FanDuel.com site is automatically configured for all mobile devices, and along with the app, they both offer all the features available on the full site. 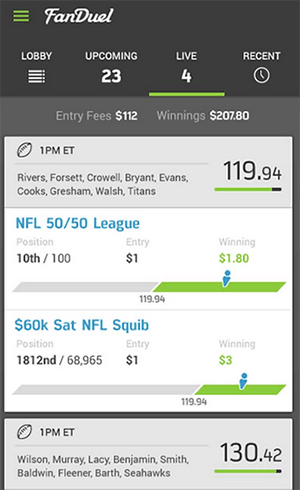 Click here to review our full FanDuel Review page. 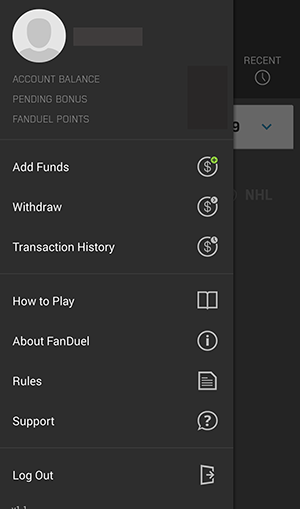 We will review both the simple to navigate FanDuel.com app and mobile site features which are both very clean and intuitive to use to do whatever you would like to do on your mobile device. Click here to learn more about the FanDuel new player promos! 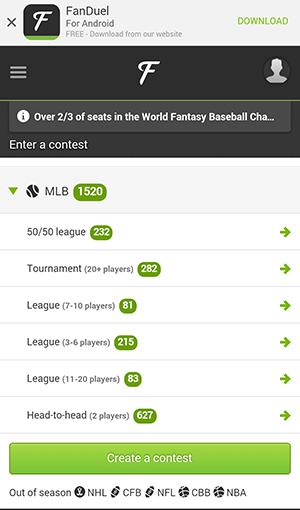 Once you open the FanDuel app, you are immediately brought to the lobby where all the available contests are listed. You can then filter and sort whatever contest types you are looking for. 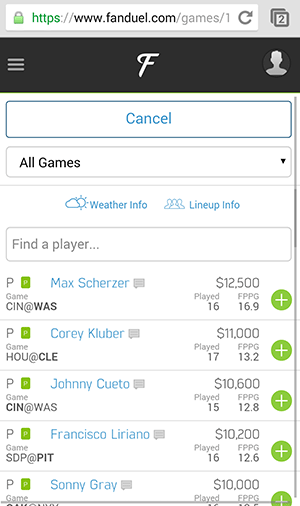 Then select any particular contest type you would like to enter and select your lineup. Once that is complete, submit your lineup for the contest and you are in! 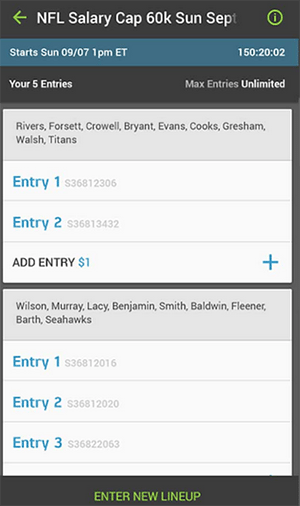 You can add any of your created lineups into any other contest by tapping on “Add Entry”. You do not have to recreate an existing lineup to enter it in another contest again. Keep up to date with live scoring on all of your contests. You can browse your upcoming and recent contests. The menu icon in the top left corner with the three green horizontal lines is where you can make cash withdrawals or deposits. 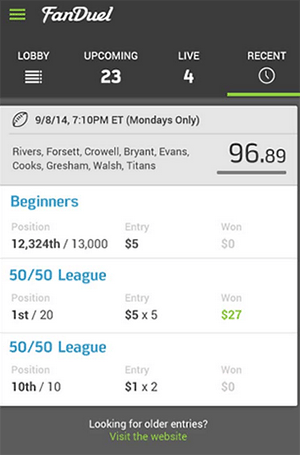 The FanDuel app is quick and simple to use and is a must for your mobile device! The FanDuel.com mobile site works much the same as the app as they have all the same features. You can download the app from the mobile site home screen. This is recommended since the app is much faster. A disadvantage of the site to the app is the site version keeps the “Download App” banner at the top of your device which takes up screen space. As you can tell below, the site screens are very similar to the app screens. The FanDuel mobile site works fine but their free app works much better. Check it out! Enter your own FanDuel review below, our guests will appreciate your feedback!